Welcome back to Study Skills – the series that brings you tips and tools to help you succeed in distance learning. This time we take a look at a key activity for any distance learner: revising for exams! It's exam time! Are you ready? Scroll down to watch the video and get our exam tips! It's finally time. Your exam is about to begin, and you're feeling the pressure. Actually, you're not feeling bad at all. Why? Because you've been revising like a pro. Watch the video to get yourself exam ready! While you watch, see if you can spot FOUR pieces of advice about using past exam papers to help you revise. Write them down if you like and you can check your answers – in an activity – later on this page. It's finally time. Your exam is about to begin, and you're feeling the pressure. Actually, you're not feeling bad at all. Why? Because you've been revising like a pro. You didn't even need to cram. 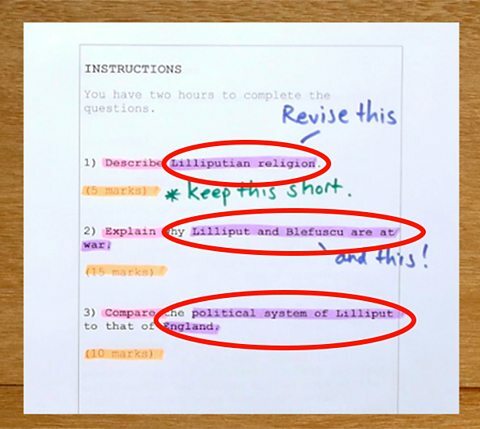 Instead you looked at old exam papers: to learn what kind of questions come up, to get an idea of the possible topics, to learn the marks available, and how long for each question. Looking at specimen answers also helped. And best of all you did this early in the term, not one week before the exam. What else? You made a plan. And you even stuck to it, well done. And you used a range of techniques just right for you. Here are a few ideas. Go on, pause the video and look them up. You also looked after yourself. You ate well, slept well and even did fun things between studying, helping you bust stress. Even if you did procrastinate a little. I said: "a little". Ahh, and here we are again. The moment of truth. Just make sure you revise the right subject. Good luck! 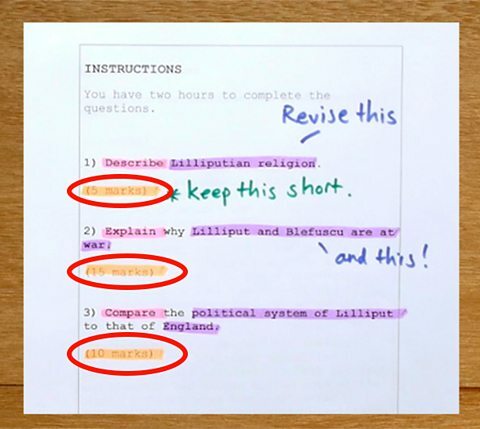 Did you spot the tips about four ways to use old exam papers when you're revising? Check you've understood with this activity. Which image shows the information you can take from old exam papers about question types? Which image shows the information you can take from old exam papers about possible topics? Which image shows the information you can take from old exam papers about the marks available? 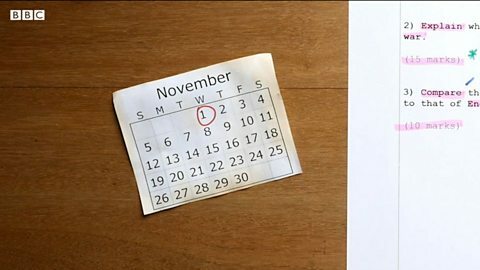 Which image shows the information you can take from old exam papers about how much time to spend on each question? If you want to give yourself the best chance of exam success, you need to be well prepared. Let's recap the nine things we've learned about revising for exams as a distance learner. Don't cram! Make sure you're well prepared for your exams to avoid having to do lots of work at the last minute! Don't throw old exam papers away! You can use them to get an idea of the questions and possible topics that may appear in your exams. Exam papers often tell you the marks available for each question – you can work out how much to write and how much time to spend on your answers. Make sure you prepare early – start looking at exam papers and revising early in the term, not one week before the exam! 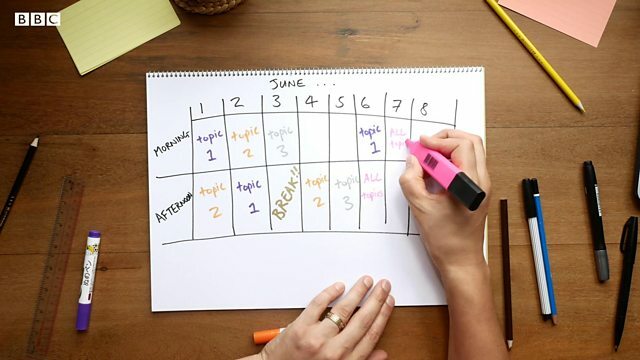 Make a study plan – and try to stick to it! 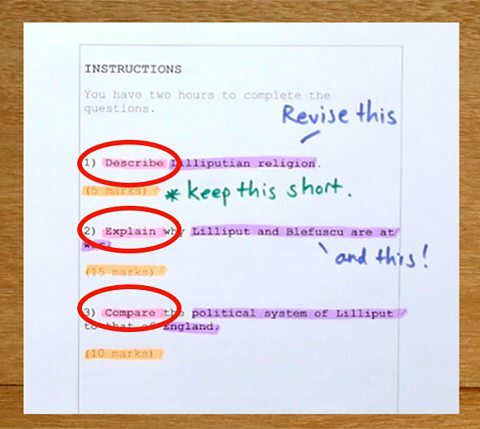 Try using a range of techniques to help you revise – you're more likely to remember things for your exams if you use a variety of study methods. Look after yourself! Eat well and get plenty of sleep to stay healthy as you revise – and don't forget to take regular breaks! Do fun things to help break up the time between your study sessions – but don't procrastinate too much! When the moment of truth arrives on the day of your exam, don't panic! Take a deep breath and do your best. Good luck!